Jamie Barton has made her San Francisco recital debut alongside pianist Robert Mollicone with San Francisco Performances. The pair were joined by cellist Emil Miland for the West Coast premiere of Jake Heggie's The Work at Hand, written for Barton and originally premiered at Carnegie Hall. 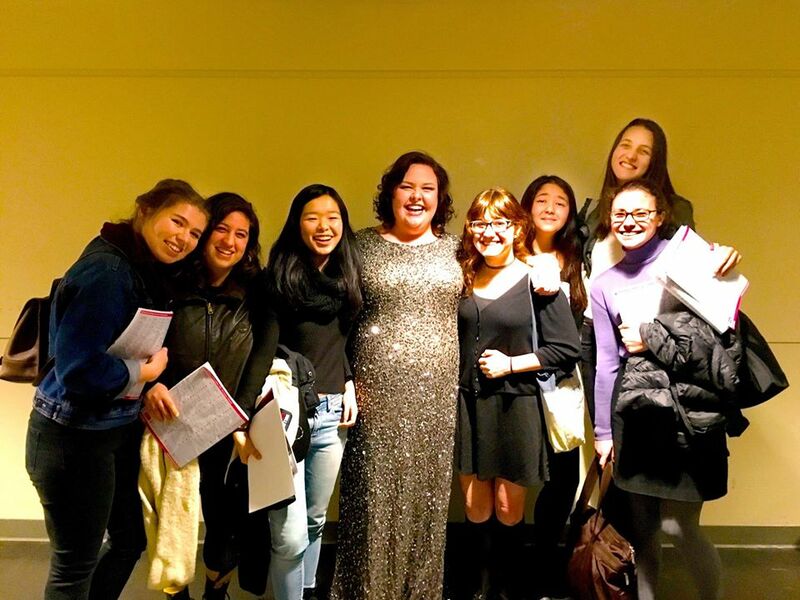 Special guests at the performance were members of the San Francisco Girls Chorus, who met with Barton backstage after the show. "Hearing American mezzo-soprano Jamie Barton in her San Francisco Performances recital Wednesday evening, at least one listener had to ask: Is there anything this artist can't sing? Music lovers who have witnessed the Georgia-born singer's mercurial rise to opera stardom -- marked by prizes at the 2013 Cardiff Singer of the World Competition and, earlier this year, the prestigious Richard Tucker Award -- could hardly have been surprised. Barton first wowed Bay Area audiences in 2014, stepping into the role of Adalgisa as a last-minute replacement in San Francisco Opera's production of "Norma." Her richly colored, voluptuous voice made an indelible impression in Bellini's opera. But that was just one role. Wednesday's magnificent program, a local debut recital presented at the San Francisco Conservatory of Music, demonstrated an even wider range of Barton's artistry. Accompanied by pianist Robert Mollicone, she sang in Spanish, French, German, Czech and English, sounding fluent and completely assured in each selection. The program's centerpiece was the West Coast premiere of "The Work at Hand," a three-song cycle by San Francisco composer Jake Heggie. Scored for voice, piano and cello, the work sets texts by poet Laura Morefield, who died of cancer in 2011. By turns somber, defiant and transcendent, this enveloping 20-minute cycle traces the narrator's journey from turmoil to acceptance, and Barton gave it a captivating, fully committed performance. Heggie, as always, writes beautifully for the voice, and with the excellent cellist Emil Miland joining Barton and Mollicone, the first song, "Individual Origami," sounded vibrant; Barton's radiant singing floated attractively over Mollicone's finely etched playing and Miland's fiercely focused cello part. The central section, "Warrior 1" (named for the yoga pose), found Barton expressing the poet's will to live with an intensity that rose to a stunning cry of the heart. In the moving conclusion, titled "The Slow Seconds," the singer's luminous vocalism was gently underscored by Miland's arioso playing. The program began with Joaquín Turina's "Homenaje a Lope de Vega" -- delivered by Barton with a mix of keen emphasis and sensual longing -- and ended with Dvorak's set of seven "Gypsy Songs." In Barton's performance, each of the Czech composer's miniature settings emerged a lustrous tableau; the fourth selection, best known in English as "Songs My Mother Taught Me," was especially lovely, with the singer evoking the music's heartfelt sentiment in ripe, glowing phrases. In between, Barton sang three songs by French composer Ernest Chausson: "Le colibri" (The Hummingbird), "Hébé" and "Le temps des lilas" (The time of lilacs.) These fragrant works showed her shapely voice to pristine advantage, and she projected their qualities of drama and sensuality in equal measure. Her readings of four Schubert songs, including the often-performed "Gretchen am Spinnrade" (Gretchen at the spinning wheel), also evoked an eloquent response. Once again, Barton's command of language and vocal dynamics were impressive. Still, what was most remarkable was her facility for communicating the dramatic essence of the texts. "Gretchen," "The King in Thule," Shepherd's lament," and "Restless love" -- each song invited comparisons with the great lieder singers of the past. Barton and Mollicone returned for a single encore, Harry T. Burleigh's arrangement of "Swing low, sweet chariot," sung with a splendid mix of warmth and ease." "The young American mezzo-soprano Jamie Barton has been garnering extravagant praise on operatic stages for the past few years, for reasons that became clear to local audiences with her magnificent 2014 San Francisco Opera debut in Bellini’s “Norma.” She’s a remarkable artist, with great reservoirs of vocal power and agility wedded to an exquisite communicative gift. Would anyone be surprised to learn that those qualities transfer splendidly to the recital stage as well? I didn’t think so. The proof of that proposition was everywhere in evidence on Wednesday, when San Francisco Performances presented Barton’s local recital debut in the concert hall of the San Francisco Conservatory of Music. The same virtues that had so enlivened her appearance as Adalgisa — in particular her ability to channel a voluminous sound into detailed and richly expressive phrasing — shone through a program of varied and sometimes little-known repertoire. Miland rose to the task admirably, with playing of sumptuous, lively elegance. Barton’s singing sounded both plush and keen, rising to two extended, climactic high notes that registered as a bold assertion of the primacy of life over death. She and Mollicone followed that up with a vigorous and sensitively phrased account of Dvorák’s “Gypsy Songs” to close the program. She moved effortlessly among the shifting moods of this set, bringing rhythmic vitality to the group’s more extroverted songs and infusing the hushed lines of the third song (“All around me the forest is quiet”) with full-bodied warmth. Barton opened her program with songs by Turina and Chausson, which called for — and mostly got — committed advocacy to make their mark. Among Barton’s most telling strokes were the quiet, almost disembodied intensity with which she delivered the second of the three songs from Turina’s “Homage to Lope de Vega,” and the unnerving luxuriance she lent to Chausson’s “Le colibri” ( “The Hummingbird”). A group of Schubert’s Goethe settings was notable for the pitiable fervor of “Gretchen am Spinnrade,” and the evening closed with a beautifully soulful encore, “Swing Low, Sweet Chariot,” arranged by Harry T. Burleigh." "Jamie Barton introduced herself to San Francisco audiences last year as a last-minute substitute Adalgisa in Bellini’s opera Norma. It was an incendiary performance that displayed a rich voice and ability to plumb the depths of the mezzo soprano range with power, as might be expected from the top prize winner of the Cardiff Singer of the World. Her first recital here Tuesday underlined those attributes and displayed an impressive command of a wide range of musical styles, not to mention five different languages. Songs in Spanish (by Turina), French (Chausson), German (Schubert), English (Heggie) and Czech (Dvořák) touched on lyrical issues of love and death. Those may been the connecting threads, but Barton’s magnificent voice provided the fundamental bond. With total command of her vocal resources, she delivered a steady diet of shapely phrases, shading one with darker tone, the next with something lighter, rising in a crescendo to a shattering climax in one song, or in the next, falling in a diminuendo to an evanescent filament of sound. She can marshal extraordinary sonic power. At times she could sound almost like a baritone and, moments later, spin out a delicate strand in one long breath that ventured into the soprano range. All that was on display in Jake Heggie’s The Work At Hand, written for Barton, who debuted it at Carnegie Hall in February. For this emotionally gripping cycle, Heggie was inspired after reading Laura Morefield’s poems, which she wrote after being diagnosed with colon cancer, and traced the wrenching process of saying goodbye to all those one loves. It makes for a rich and rewarding 20 minutes of music. Barton has remarkable ability to focus her powerful voice into service for the words, which are alternately aggressive and heartbreaking, and ultimate affirm the primacy of life to the end. Heggie’s music underlines those aspects, and shades each line with an appropriate tone. This is a composer who believes in real melody and seldom strays far from familiar harmonies, but always makes the music feel unconventional and fresh. The recital started with Turina’s Homenaje a Lope de Vega, the Spanish composer’s take on three sultry poems about sexual desire. Barton wove her supple voice around exotic melodic turns and delicately sensual rhythms. Three songs by Chausson traced the course of love from youthful ardor to—in “Le temps de lilacs”—the realization that death is near and sweet memories are all that’s left. Barton sang with consummate grace and poignancy. Four Schubert songs concluded the first half. What made Gretchen am Spinnrade, stand out as the best was Mollicone’s delicately insistent tracing of Schubert’s allusion to the spinning wheel and the way Barton captured Gretchen’s anxiety at losing her lover. She reached a searing vocal climax at the finish, describing an imagined final kiss. Dvořák’s Gypsy Songs included a gorgeous treatment by both Barton and Mollicone of the familiar “Songs My Mother Taught Me,” and ended the recital with flair, and a lone encore, Harry Burleigh’s simple and soulful arrangement of “Swing Low, Sweet Chariot,” brought out Barton’s earthy edge. I would plan to hear her any chance I got."